102 Walnut has a rich history dating back to the late 1800’s where it housed many businesses including a meat chop and candy store. Today, 102 Walnut is currently under construction to accommodate ground level retail stores and residential apartments on the upper level. The exterior will be restored to its bright red brick while the interior will feature all modern amenities. The building is situated on a prime location in downtown Winona; a perfect place for retail store and residents who want to take in everything Winona has to offer. We are very excited to see 102 Walnut restored to its red brick glory! 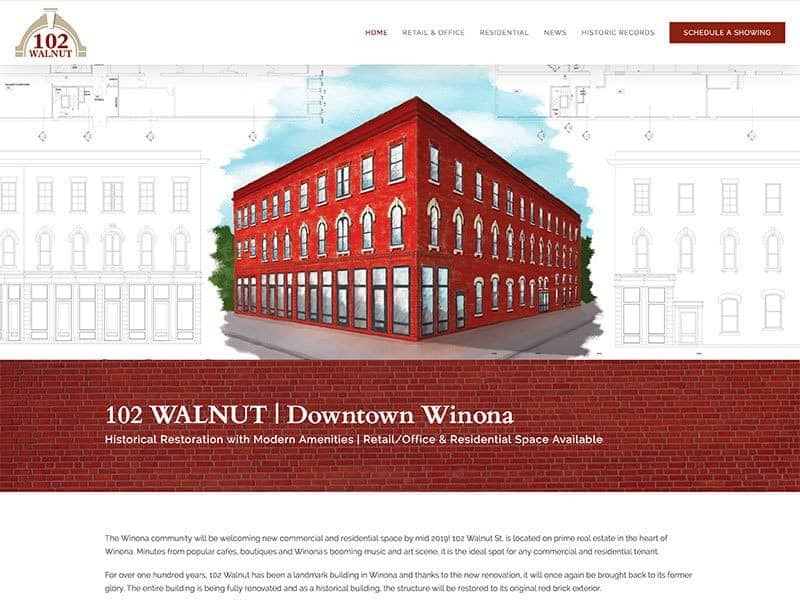 As 102 Walnut is being renovated, we worked with the property owner to create a website that would keep people updated on the process and promote the available space for potential retail and residential tenants. The website highlights the amenities of the building and, as floor plans and further information becomes available, more will be added to the site. The website has strong calls to action and a prominent contact button in the main menu that encourages potential tenants to contact 102 Walnut for further inquiry. Because of the building’s rich history, we were also able to add an informative timeline and description of the building. We think it is very cool to incorporate the past into the future plans of 102 Walnut! If your company is in need of a stunning new website, contact us today!